Our 2 Touchless Automatic bays feature LaserWash technology that offers 10 powerful cycles that enable customers to drive off with a clean, shiny and dry vehicle. 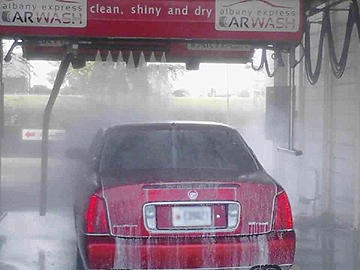 Albany Express uses high water pressure to clean the vehicle instead of brushes, minimizing the chance of surface damage to the vehicle. Our 6 self-serve bays offer detailed instructions to help our customers clean and protect the finish on their vehicles. High powered vacuums, fragrance machines, rug shampoo, rug beaters and detailing supplies are available to help your vehicle leave clean, shiny and dry.